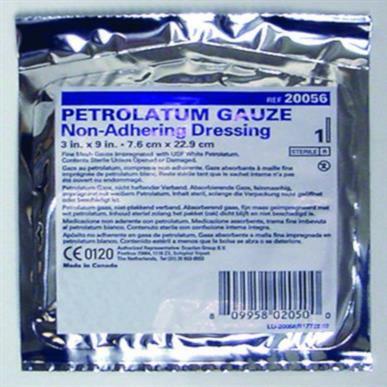 Navigate: StoreFront / Wound Care / Dressing & Bandages / Non-Adherent, Impregnated & Island Dressings / Vaseline petrolatum gauze, 3"x9"
Fine mesh, absorbent gauze impregnated with white petrolatum. Petrolatum impregnated remains moist, nontoxic, non-sensitizing and non-irritating. 3 inches x 9 inches - Sold by the each, 12 sterile dressing per box.